Today’s email from P&B has made me think for a moment about weathermax covers. Datchet is a tough environment on covers. I think it’s all the kerosene that spews out of Heathrow aircraft that does it. The old type covers get very blackened and sometimes slippery in that environment. Horrible, it is. I used to get 5-6 years only out of the old type before they needed replacing. In fact, they used to discolour quite badly even after just a couple of seasons. I’m just realising that my weathermax cover, from Goacher Sails, is about 18 months old and still looks crisp and new! So this material is really great. The only downside I’ve noticed is that when trailing it can rub straight through (where the side supports are), so maybe some strengthening patches there – ironically of the old material! – would work. Other than that, it’s brilliant ! I just looked up the P&B one from their email – it’s a little over £300. I must say that it had never occurred to me before that there could be more than one way to skin this particular cat – hull protection while towing. The ‘normal’ style undercover can be a bit of a fiddle to get on and off, but this idea goes at keeping the spray away from a whole different viewpoint. You can elect to have it made in Weathermax material. We have a couple of these now at our Club, so it’s interesting to see how they are getting on. 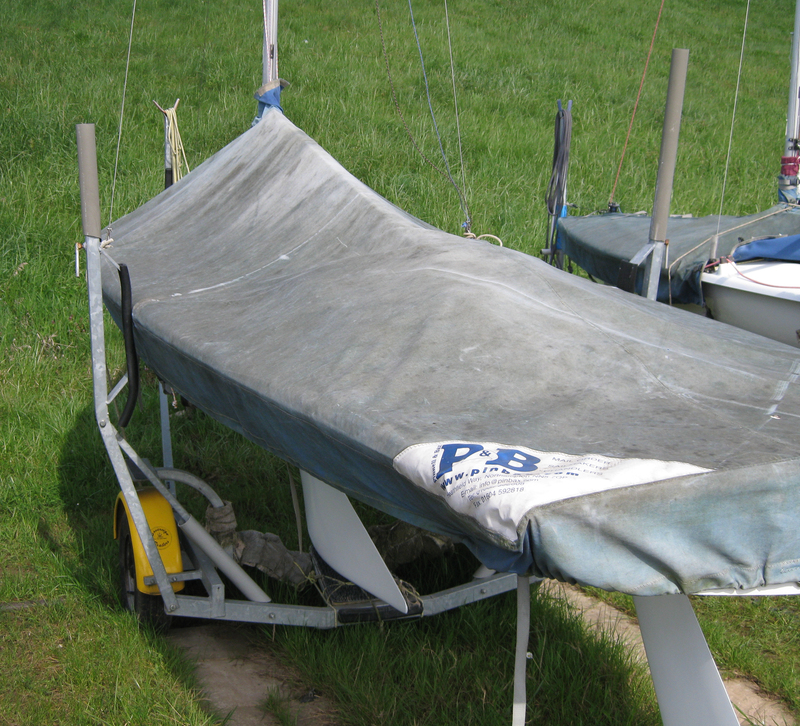 Datchet has a climate that is very harsh to boat covers (we think it is Heathrow air that does it…), and I noted with interest that P&B say theirs are guaranteed for five years. I must say, at one year old our cover (by Goacher Sails), is certainly wearing well. Normally I would expect to replace after five or six seasons at Datchet and this one feels like it has aged very little in the first twelve months. It’s still very light, crisp and mould free. The only thing I have noted so far that it is so much thinner than the “old stuff” that it can wear through at rub points when towing. I tighten my trailer arms up on the road, and on one side we’ve popped through the fabric there. On the next cover, if I ever get one (! ), I’ll ask for an extra strengthening panel there. 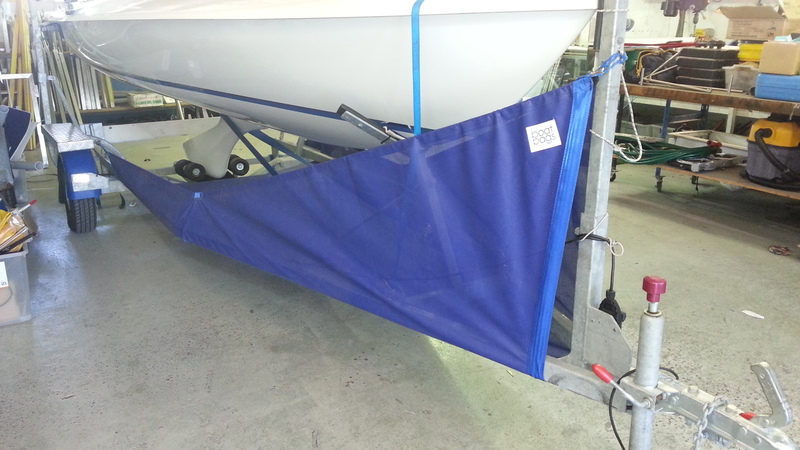 Did you see that the discount deal for P&B sails and Covers has just been extended to January 20th!?!! Have you seen the announcement of 15% discount off covers at P&B until 21st December, …. Santa??….!! How long do you reckon to get out of a cover?? In the London environment, where cyclists wear facemasks, I reckon to get five, maybe six years. Is it more where you are?? Anyway, for our fleet, the P&B seasonal offers are always good news and 15% is a real motivator. This is the link to the P&B Covers Page. Our covers are made from high quality PVC coated polyester or Weathermax, a new fabric that combines breakthrough UV technology with water resistance, breathability and durability so that it can protect your boat for longer. 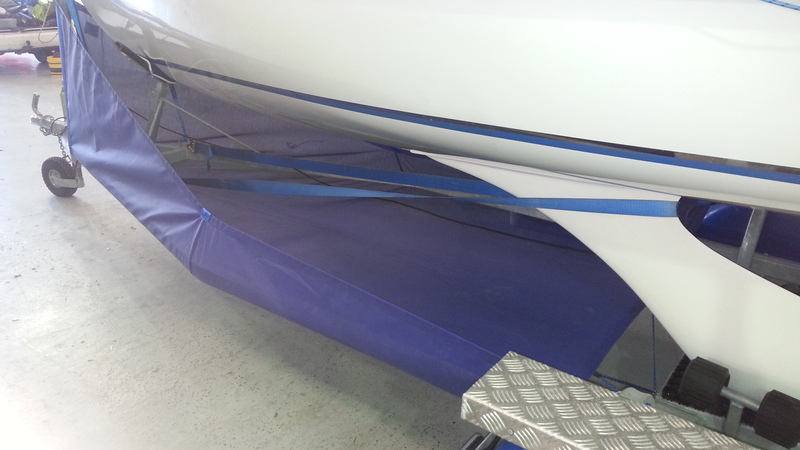 I’ve just got a cover made in weathermax for our boat …. It’s much lighter material than we are used to, and when new (at least) it’s quite slippery. Light when wet, even. So using it, as in “putting it on”, is a bit more pleasant an experience. It’s strange stuff as it appears not to be coated on either side. In fact, to the naked eye it looks the same both sides. You are aware that it is man-made material, but somehow, it does not seem at all plastic. So is there anything not to like?? Well, when wet, or even just the morning dew, it holds the water (when new anyway) in big globules on the surface. Just maybe, surface tension is enough to stop the water running away as quick as you’d think – it seems to have zero water absorption…. So when you roll it up and then lift it off the boat, great streams of water run all over your jeans. Yuck!! The best tip here is to get your bowman to take the cover off instead…!!! Flying Fifteen Covers – Hints and Tips 4…. Cost…. So you have just bought your first Flying Fifteen and brought it back to the Club. It needs a new cover…. But maybe your new pride and joy is 25 years old, cost a thousand, or maybe 500 off eBay !! So a new cover looks a disproportionate investment !!!! What to do?? Well, this is essentially the problem we have with the fleet of Club Loan Boats for the Trial Sail Program. 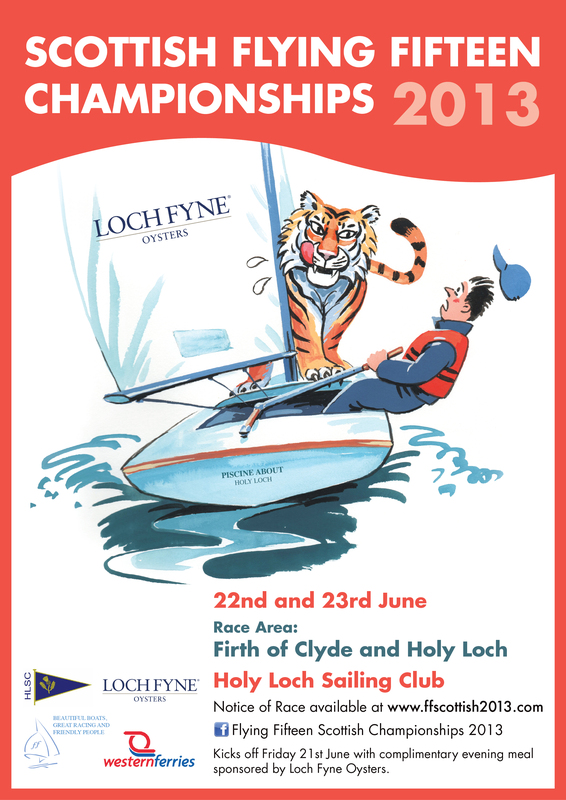 (see Trail Sail tab on the website, beneath the banner photo) We have found that you can get a really good deal by going to the Sail Register. The covers seem fine, fit for purpose, and a realistic price for the older boats. A flat one is about £135 as I type this…. 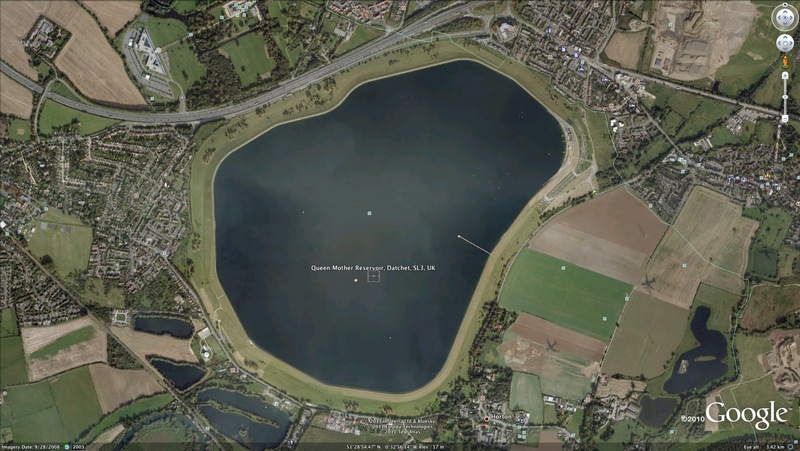 Flying Fifteen Covers – Hints and Tips 3….. In general it is true that you want pretty firm and secure lines under the boat to stop your cover pooling – it is especially true for flat covers. For a decade we just had plain lines that we used to tie, and to be honest they worked OK but were a bit fiddly to tie really tight. At our club, two types of clip are common. This is the first and very common type. The strap is a preset length, and the two plastic ends clip quickly together. I think this is great and very convenient. I’m not sure that they stay 100% tight though. Maybe they slip when left alone, or maybe as one does them up they give a little – so you do see some in the boat park a bit too slack. That’s when the trouble starts…. We have this second type. It takes a few seconds longer to do up, but at least you do know that you leave it firm and tight every time you leave the boat. 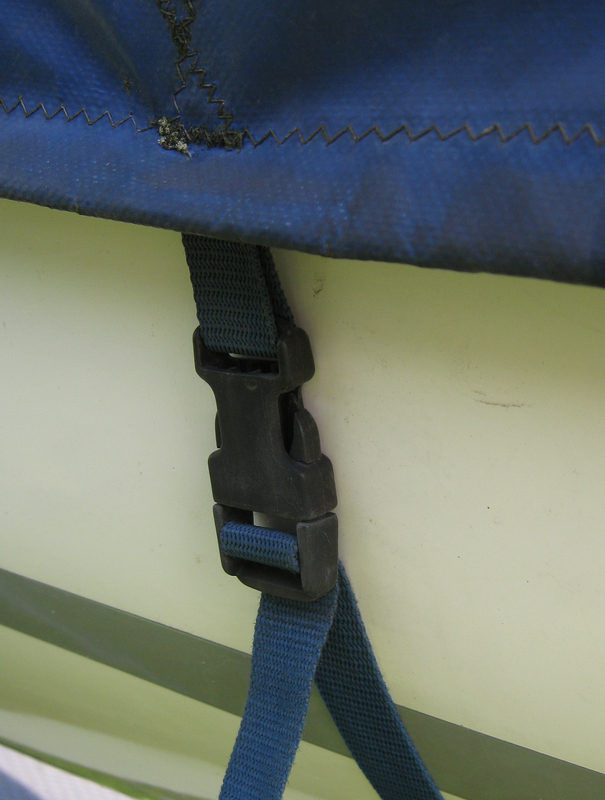 Once you have threaded the loose end of the strap through the buckle, you just give it a tug and it self locks very effectively. So look for these especially on a flat cover…..
Flat Covers – Hints and Tips 2 …. We like to get something like 5-7 years out of our cover, so we live with it a long time. There are a couple of simple things that make living with it easier and less hassle. I got fed up with the normal nylon clips at the shrouds snapping off. Maybe it is the load, or the UV or something – but they don’t often last as long as the cover – and I like the skirt string really tight. 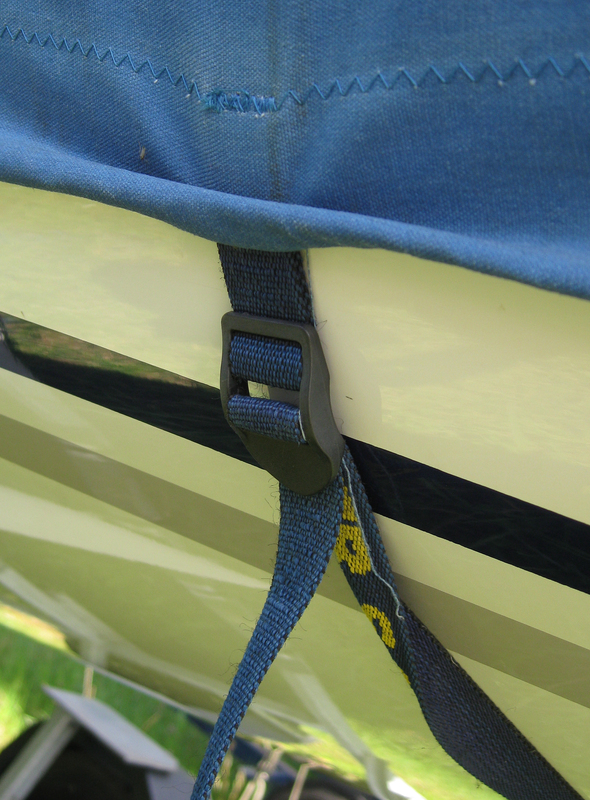 So we immediately replaced ours each side with two small stainless englefield clips (see photo). They are very quick to use, and cost less than a pound I think. Next time you have something on mail order from P&B, just get them to include two pairs of these so you don’t pay extra postage. We like to cover up while trailing. 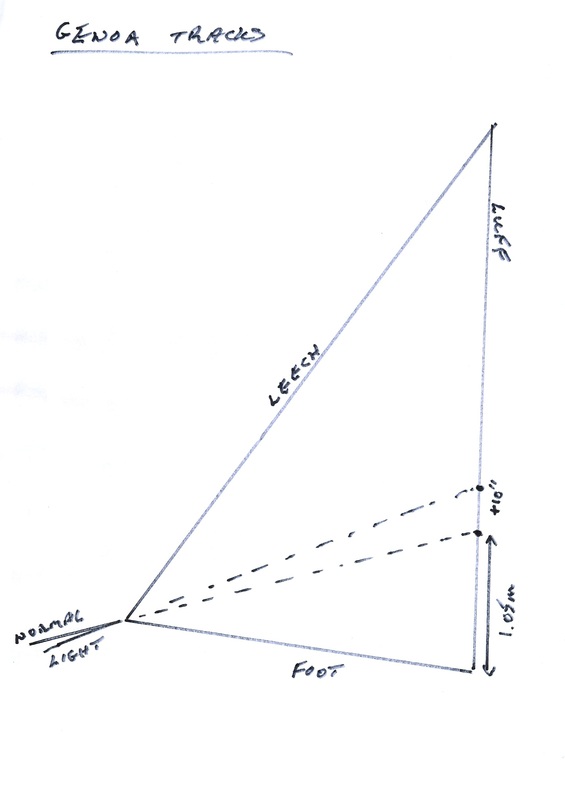 The boom cannot be trailed across stern and fore decks – it has to be stowed away. So you simply tie the normal mast loop up to the horizontal mast to “dome” the cover. However, we find that in very heavy rain, the cover can still start to puddle over the helmsman’s cockpit. On this cover, we asked the maker to add a second loop (see photo) over the rear cockpit. We secure that up to the mast in its trailing position and that seems to work a treat…..
You’ve chosen a flat cover for your new FF?… Do we have any tips to keep everything smart?? You can get a mini boom-up effect by ensuring your boom sits firmly and reasonably centrally from stern deck to fore deck. We sit ours in polystyrene pads at each end – just cut from the last electrical product to be delivered at home. 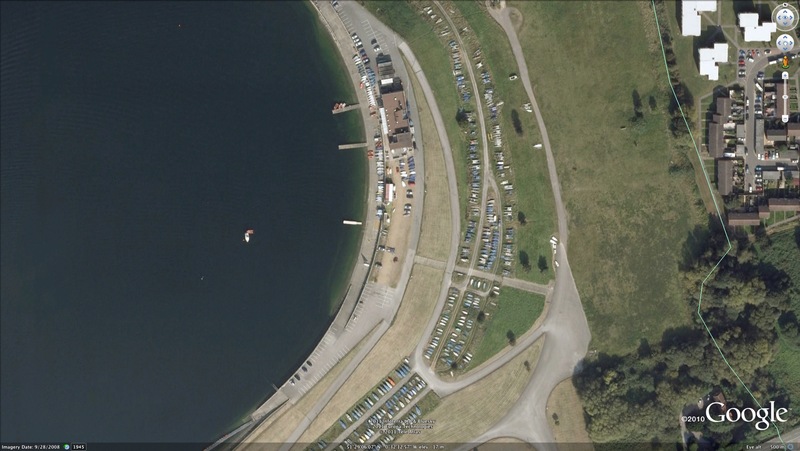 A couple of the teams use old drain pipe, windsurfer masts and that kind of thing… It is surprising though the number of Datchet members who leave it at that or just slackly attach the main halyard to stop the halyard flapping around…. Most flat covers, like this one, have a central loop to cause a “dome” effect and held stop puddles forming over the cockpit. We have a stop knot on the main halyard to get the length right, and the halyard has a loop at the masthead end. 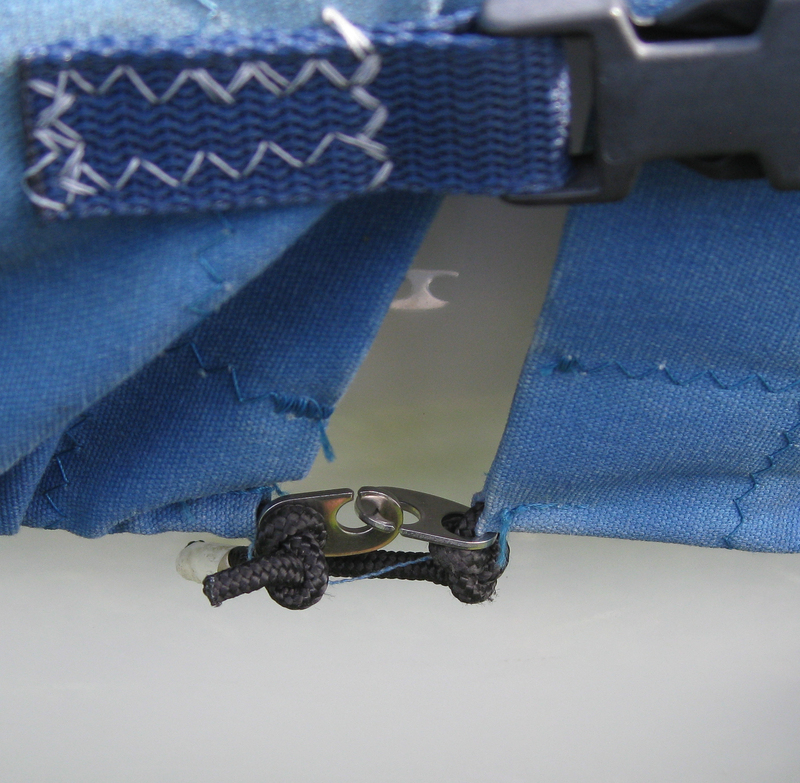 Then we just have a short piece of blue line attached top the cover loop. We tie this to the halyard end as the last thing we do when putting the boat to bed. If the bottom straps are tight, then you get no puddling….. Flying Fifteen Covers – what to think about…. So you’ve bought your first ‘new’ Flying Fifteen and brought it back to the Club…!! Everything looks in great condition, but the previous owner had been shy about replacing the cover before sale. That’s pretty common ….. So in buying a new one, what do you have to consider?? Well, the first obvious thing is the choice of “flat” or “boom up”. In our fleet, about 1/3 buy boom-up, and 2/3 buy flat covers. On boats I owned previous to Fifteens, I always had a boom-up covers. Now I am a convert to “flat”. The cover shown here is a typical, and well made P&B product. Looks very fit for purpose – so why did I choose flat? 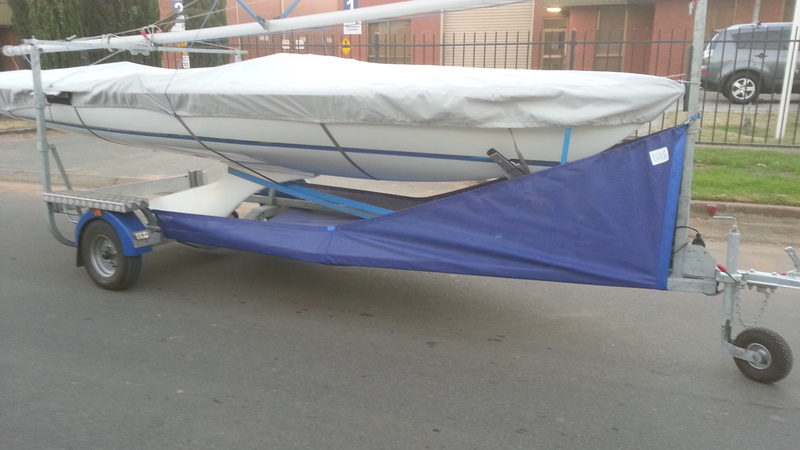 Well, unlike most boats, the Flying Fifteen sits very high on its trailer. We do without any kind of step ladder to get up on the boat, and so it is critical to us to be able to reach over the cover to do it all up after sailing. 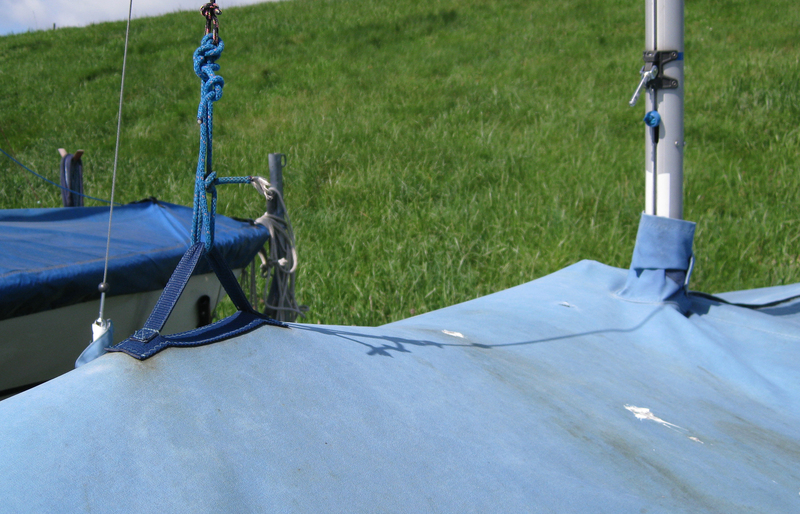 That gooseneck where the cover has to be secured is a heck of a height above the ground…. The second consideration is “do you want to tow?”. I must admit I have a very strong preference to cover up when I tow. I stow all the sails in the boat and from a security and cleanliness viewpoint, I want the boat covered. That predictates a flat cover, unless you want to own two. The FF has no rudder pintles, so you need to think about how you fix your lightboard. If you don’t cover up, you need a light board on a piece of GRP moulded to fit over the transom. It must be me, but the VC and I have had two of these boards bounce off on long motorway journeys – disaster! If you have a flat cover, then you get another and I think better, choice. The big cover manufacturers put a pair of loops on the back of the flat covers to securely attach a standard light board. This works very well – and I’ve never had one bounce off….